Round Six of the 2018/2019 Cranecorp WA Modified Sedan Series will be held this Saturday Night at the Makit Hardware Narrogin Speedway in the Great Southern Region of Western Australia. The sixth round of the series doubles as the annual Holden vs Ford Stampede and is supported by Sanmel Contracting. Thirteen Modified Sedans are set to do battle with Nathan Penn enjoying a healthy lead in the point standings heading into the penultimate round. 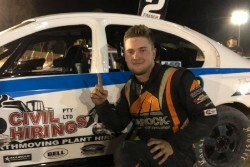 Former WA Modified Sedan Matt Noakes has won two rounds of this summers tournament and has enjoyed a strong season aboard his Glenbrae Trucking Ford Falcon. Branden Fraser has been in career best form of late and should be prominent this Saturday Night along with local Paul Stevens who has been a model of consistency in his Edwards Holden backed entry. Each driver will contest six heat races ahead of the Southern Stump and Mulching Services Shootout and Twenty Lap Main Event.